MusicSkins LLC deed with No-Refresh to introduce online custom laptop skin designer tool to provide their end users an exciting platform for creating self-adhesive vinyl skins. Their users can simply position, resize and manipulate the image along with the addition of background colors and text. No-Refresh supply MusicSkins a fully featured custom laptop skin design software that is easy to operate by their end users. It got stupendous functionality and specification that offer the ultimate level of personalization for the coolest vinyl skins on the globe. By using this tool, their customers can position and manipulate the image and thus express themselves in some better means. MusicSkins is a two year old US based company which has grown rapidly within the $150 million vinyl skin industry. Ranked as one of the top 3 world-wide market share leaders, MusicSkins was chosen as the "Worlds Greatest Skin Company" by the ION Network (Formerly PAX Network). MusicSkins LLC is the industry leader in music, fashion, art, television, and pop culture premium quality, vinyl skins. MusicSkins as the source for the coolest skins on the planet. Here, the online Customizer tool provides the ultimate level of personalization. MusicSkins LLC views every personal electronic device as a portable canvas for style and individuality. MusicSkins are a powerful marketing and branding tool for all corporations, both large and small. MusicSkins LLC needed to introduce online custom laptop skin designer tool application to provide their end users an exciting experience on personalizing laptop by creating self- adhesive vinyl skins which will defend their device from the harshest scratches. The company simply wants to provide a platform to their valuable users where they can express themselves by using the tool. 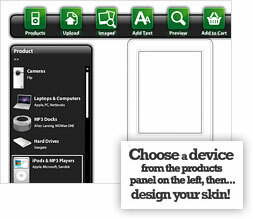 Music skins needed an easy-to operate tool through which user can size, position and manipulate the image. In addition to that, software allow them even add background colors and text. MusicSkins LLC turned to No-Refresh for designing and development of online custom laptop skin designer tool application as a portable canvas for style and individuality to provide their website users an ultimate experience of personalization and customization of laptop skin designing. No-Refresh delivered MusicSkins a fully-featured custom laptop designing tool application within minimum turnaround time decided by company. MusicSkins started off with offering its valuable website user the facility to create highly customized/ personalized self-adhesive vinyl skins for their laptops. No-Refresh created a powerful custom laptop skin designing software featured with outstanding functionality and specification like Product Management, Design Management, Form Management, Newsletter Manager, User Management, Discount Management, Page Header Management, Font management, Color Management, Order Manager, Purchase Register Manager and lots more. After installing online custom Laptop Skin Designer Application Software developed by No-Refresh in their web portal, MusicSkins has been ranked as one of the top 3 world-wide market share leaders. The company has grown rapidly within the $150 million vinyl skin industry. MusicSkins was chosen as the "Worlds Greatest Skin Company" by the ION Network (Formerly PAX Network).